C.C. is a Female Russian Blue Cat for adoption to a very loving home in or near The Woodlands, Texas. This very special Cat is 14 years young and weighs about 9 pounds. CC is a very healthy senior cat with plenty of love and joy left to offer an attentive cat lover or family. CC has been spayed and is up to date on her shots. CC is a “human-a-holic”. She loves her humans with a passion, and considers all other cats to be rivals in her quest to get all the attention – all the time. She has a glorious personality; playful, cuddly, outgoing and very devoted – she just does not get along with other cats. CC’s owners love her so much, but with ongoing spats between the cats in their home, it has become necessary to make this very difficult choice to place CC in a new home. (Her 10 year old cat-housemate has health issues, so must stay with his owners). They are dearly hoping to find a home for CC where she will be cherished, given lots of attention and playtime and be lovingly cared for the remaining years of her life. If you have been looking for a very special feline friend to add that missing ingredient to your life, please consider adopting CC. She is one of those very unique cats that is rare to find, and a joy to belong to. CC can’t wait to meet you and purr her way into your heart and home. Adopt CC the Russian Blue cat today. CC will be rehomed with some supplies and her veterinary records. Questions about C.C.? Contact our The Woodlands Cat rehoming team today. Text “C.C.” to (888) 833-2128 or email C.C.@Cat-lover.us. We look forward to hearing from you. Accessories Included: Her favorite blanket, all her toys, and a supply of cat food. We love her play; the way she bats her toys around is so much fun to watch. When we return home we know she will greet us at the door, she flops down to the floor and rolls onto her back in a really cute way. In the mornings she is always happy to see that we are getting up and wants to be wherever we are, she likes to be held particularly at this time of the day. C.C. is always friendly with whomever comes to visit, and enjoys the petting she receives. During the day she will come for a quick visit and then go back for her nap, but its as if she is checking on us and making sure we are o.k. Currently we are in an apartment on the forth floor, on occasion C.C. will join us on the balcony, but prefers to remain an indoor cat. We have been a cat family for over 30 years, our adult children enjoy C.C. when they visit as their lifestyles don’t allow them to have a pet. C.C.’s Favorite Toys, Foods, Activities? We have an abundance of toys for C.C., and although we play with her she almost seems to prefer her own games. C.C. is very entertaining! We have had many times where we have watched her manipulate a drawer to open that contains T-towels, once its opened enough she one by one pulls out the towels so she can go inside the drawer. In the mornings I have a routine of walking through the home and closing all the cabinet doors that she has opened while we slept. Why is C.C. Being Rehomed? We have another 10 year old cat that we have had since a baby kitten, sadly C.C. doesn’t like to share us with her. In our opinion we feel C.C. is best suited for a family where she is the only pet. I adopted C.C. four years ago from a family who could no longer keep her and it was her sweet personality that won me over, however unfortunately the two cats do not get along. We feel C.C. would do very well with an older owner(s) who is looking for a companion that is fun, affectionate and loving. C.C. is in very good health. C.C. is an older cat but only in her years, she plays like a kitten. C.C.’s fur hardly sheds, a real bonus after having cats that are the opposite!! 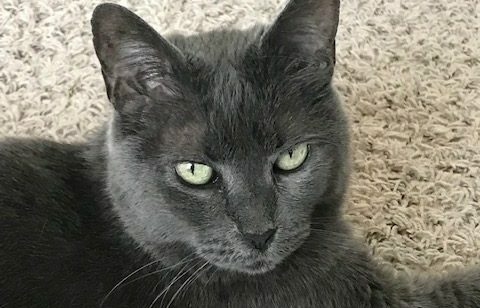 If you are interested in adopting this special Russian Blue Cat For private rehoming in The Woodlands Texas, please fill out our online meeting request below. Once received and reviewed, our staff will ask the pets owner to reach out to you and arrange a meeting. Questions about C.C.? Contact our Russian Blue Cat rehoming team today. Text “C.C.” to (888) 833-2128 or email C.C.@Cat-lover.us. We look forward to hearing from you. Adopt this sweet Russian Blue Cat in The Woodlands Texas today.